One of the most serious health concerns affecting seniors is loneliness due to lack of companionship. Even seniors who work with Retire-At-Home in Toronto have told us that after their caregiver leaves for the day, they suffer from a sense of loss. Being alone for hours and days on end can have a negative effect on our elders, even more so than certain physical ailments. As a senior home care company, we are concerned for our clients who are alone for long periods, and are feeling lonely. Although pets and seniors are not always a good match, our tips below may help you decide if it is the right choice for your loved one. Pets and seniors may be a solution to loneliness, but is it appropriate for your loved one? 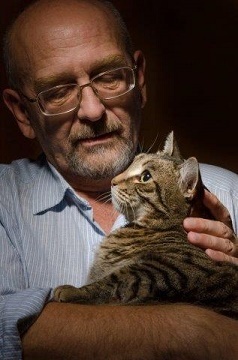 One solution that many Toronto seniors are choosing is to adopt a pet as it’s one of the best ways to combat solitude. Elderly citizens who have adopted a pet have more energy, are more likely to engage in social activities and they exhibit happier and healthier lifestyles. Before starting the adoption process, here are some tips to keep in mind. Even if your parents have never suffered from allergies or asthma, it’s a good idea to visit their health care professional (who may refer to an allergist) to ensure that animal dander does not negatively affect mom or dad’s health. Having an extended visit from a friend’s dog or cat may also help determine if there is an allergy. Depending on your choice of animal, having a pet is a big responsibility. If you are thinking of getting a dog for example, will your parents be able to take it for a walk on a regular basis? Do they have the right property for the animal of choice? Will you have easy access to food and other pet requirements like kitty litter? If you are unsure about adoption, perhaps “fostering” an animal is a better option for parents. This will be a good trial-run to see if pet ownership is something your loved one can commit to. The last thing you want is to bring a sick or unhealthy animal into your home or the home of your aging mother and father. Be sure to take the animal to a veterinarian for proper screening. The veterinarian can also offer professional advice about the nature of the pet and help determine if this is the right pet for you. Bringing an energetic golden retriever puppy into the home of a senior with mobility concerns is not a great idea. Whether you choose a cat, a dog, or a lizard (!) 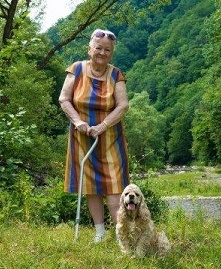 be sure to think about how much activity will be required from the senior so that everyone remains happy and healthy. With cats and dogs, there are breeds that will be the right match for each situation. As a rule, more mature pets tend to be better suited to join a senior family as they will require less training and exercise. Cats are great indoor pets that can be very affectionate and provide plenty of tender loving care to their owners. The love and comfort a pet provides is priceless, however, there is a financial commitment involved. Not only will they require food but also consider regular visits to the vet and potential health issues as well. Many pet owners are taking out “Pet Insurance” to help cover costs that may come up as their pet ages. The monthly fee for pet insurance will differ from one animal and breed to the next. If you have never owned a pet or had extensive periods of time caring for an animal, jumping right in to adoption might not be the best option. Instead, see if you can take care of a friend’s animal while they are away. Or plan regular visits to a friend’s home so that you can learn the ins and outs of pet ownership. It is so important to know what you are getting yourself into before you adopt. If you have ever owned a pet, you understand how quickly they become a member of the family. Ensure that you and your loved one has a plan in place should your loved one pass away. It is not uncommon to include this plan in your will. Organizations exist that will help match seniors with the right animals. As we mentioned, it might be tempting to adopt a puppy or kitten however they require so much more attention, physical care and training. Older animals are more likely to be calm and well-trained and elderly citizens find them to be better companions. Check out The Farley Foundation (http://www.farleyfoundation.org/) and the Toronto Human Society (http://www.torontohumanesociety.com/adopt-a-pet) for more information about adopting a pet for a senior. As a senior home health care provider, Retire-At-Home Services understands that a pet is an extension of a senior’s self. When visiting your loved one, we will look after the pet as well. We will walk your dog, ensure it has food and water, or help your loved one bring the dog outside or to the spa. Loneliness is real and affecting our elders. If a suitable pet can be chosen to keep your loved one company, we can help you look after it.